Finding himself the subject of sanctions by the United States for alleged support of the government in Syria, Kirsan Ilyumzhinov, President of FIDE, made the surprise move this week of relinquishing most of his authority to his deputy, Georgios Makropoulos. 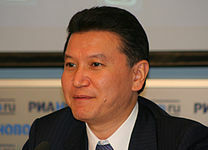 According to an announcement, however, by the World Chess Federation, Mr. Ilyumzhinov has withdrawn from all “legal, financial and business operations” only on a temporary basis. Speaking with the Russian Chess Federation, the colorful FIDE leader called the accusations “ridiculous”. My conscience is clean, and I am absolutely sure that I am right. Moreover, in response to the sanctions by some bureaucrats, unknown for now, I decided to make a gift to the real chess fans in the United States. Along with the World Chess Championship, their country will also host the World Rapid and Blitz Championships among men and women as well as the largest children’s tournament. We also declared the year 2016 a Year of Chess in the United States. Reminds me of FIFA’s shenanigans.